Toronto-based Red Sky Performance has several reasons to celebrate in 2010. This year marks the innovative company’s 10th anniversary, and their inclusion as a highlight in the Cultural Olympiad at the 2010 Vancouver Olympic Games. Red Sky presented its stunningly vivid dance creation, Tono, featuring dance and live music that connects the Indigenous cultures of Canada, Mongolia and China from February 11 – 14 at the Vancouver Playhouse. Red Sky’s Tono’s production history is impressive; it was featured as part of the Closing Ceremonies of the cultural programming of the 2008 Beijing Olympics, the 2008 Meet in Beijing Festival, the International Arts and Culture Festival in Inner Mongolia, the 2008 Summer Arts Festival at The Banff Centre in Alberta, and the 2009 Luminato Festival in Toronto. Continuing their tour in Western Canada in 2010, Tono will also tour to the High Performance Rodeo in Calgary, the Arden Theatre in Edmonton, and will continue throughout Canada, the United States and overseas, including the Opening Gala for Canada at the World Expo 2010 in Shanghai, China. Conceived and directed by artistic director Sandra Laronde with choreography by Sandra Laronde and Roger Sinha, Tono speaks to the tribal identities of Indigenous peoples in North America and is heavily grounded in the themes of horse culture and shamanism, spanning plains traditions in North America and Asia. 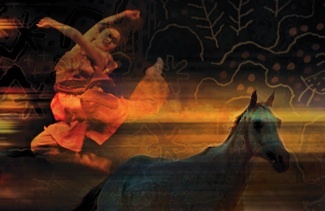 The thundering images of horses on the move are magically conjured by six dazzling dancers, stirring long song and throat singers from the ancient Mongolian steppes and the haunting lilt of the morin khuur (horse-head fiddle) and traditional music from the Blackfoot and Ojibway nations. Tono mesmerizes audiences with this celebration of the creature universally regarded as the epitome of strength, grace and beauty. Red Sky is one of few companies to have two productions at the 2010 Vancouver Cultural Olympiad. Red Sky’s family production, Raven Stole the Sun, will be presented on Granville Island, in Vancouver and Whistler from February 20–25. This production has toured internationally, with rave reviews from audience members of all ages. In ten short years, Red Sky has become renowned for its artistry, innovation, and a touring force of original Indigenous work across Canada and around the world. Red Sky is well-respected and plays to capacity houses wherever they go. Red Sky Performance is a leading company that shapes contemporary world Indigenous performance in dance, theatre and music. Bursting on to the scene in 2000, the company was founded by Artistic Director Sandra Laronde who hails from the Teme-Augama-Anishnaabe (People of the Deep Water) in Temagami, Northern Ontario. The unstoppable Laronde is also the director of Aboriginal Arts at The Banff Centre, dividing her time between Toronto and Banff.